Spider-Man's been around the block a few times, and if there's one thing we've learned about this character, it's probably just that Spidey's gonna Spidey! He's been starring in comic books since 1962, and the 21st century has brought us multiple iterations of Spider-Man in the movies. And we don't care whether you're all about those vintage comics, grew up with Tobey McGuire as the famous character, or are all about Tom Holland taking the reigns as the web slinging hero. When you gotta get your Spidey on, you just gotta get yourself a Spiderman costume! And that's what we're here for, because as your top shop for costumes worldwide, you know that we have the premier selection of all the best superhero costumes to be found. 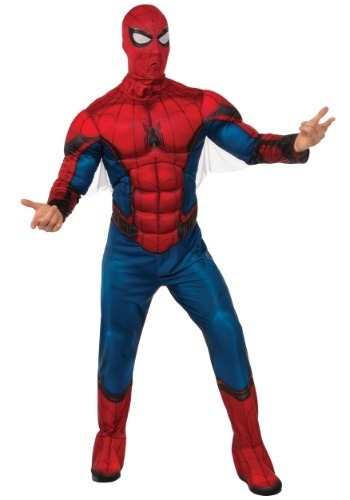 And this deluxe Spider-Man costume is definitely at the top of the list! Your only intentions might be to have a ton of Halloween fun, but if you are intent on saving the day too, this would be the costume to do it in! This jumpsuit costume has all the signature style of the his classic costume along with printed web details to give it a modern touch. It features his logo on the chest, along with integrated bootcovers, a hood mask, and even polyfoam muscle effects built right into the suit, so you can feel just like a bulked up web slinging hero. Get this costume, and while you might not be able to take on the likes of Doc Oc or Vulture, you are going to look like you'd be able to. And that's really the point, isn't it?